The first airport built on an artificial island became operational in the Ordu province on Friday. At a ceremony, attended by President Erdoğan and Prime Minister Davutoğlu, held at the newly inaugurated airport located between Ordu and Giresun on the Black Sea coast, it was pointed out that 35 million tons of rocks were used to complete the TL 320 million project. Europe's first airport built on an artificial island opened with a ceremony attended by President Recep Tayyip Erdoğan and Prime Minister Ahmet Davutoğlu on Friday. 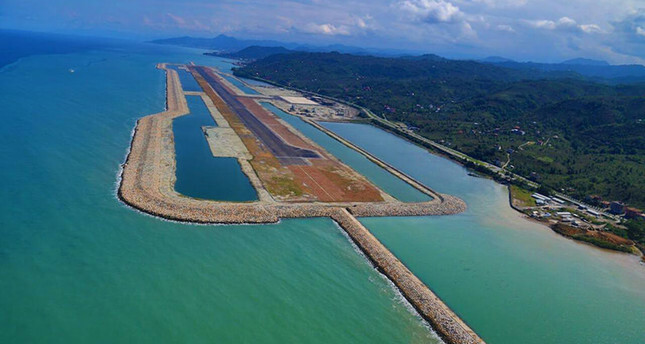 The airport situated between the northern Turkish provinces of Ordu and Giresun is the eighth airport in the world to be built on an artificial island. Construction began in 2011 on an artificial island opposite the coast of Ordu's Gülyalı district. The airport is named after the two provinces, as it is located 19 kilometers from central Ordu and 25 kilometers from Giresun. The airport was built on an artificial island because no suitable location was found among the region's geographically-challenging provinces, where rugged mountains run parallel to the coast and create an obstacle for arriving flights, particularly from Russia. It is also the 52nd airport in the 81-province country. Around 35 million tons of rocks were used to fill in a 1.8 million-square-meter area in the sea. The airport, which cost around TL 360 million ($132.6 million) to build, features a 20,000-square-meter terminal. The idea for an airport on an artificial island for the two provinces was first conceived in 1992 and construction began in 1994, but it came to a halt shortly afterward due to high costs. Concerns were raised over the durability of the airport that is situated in an area where storms and heavy rainfall are common. State-of-the-art technology was used to prevent "wild" waves from damaging the airport, Ordu Governor Irfan Balkanlıoğlu said in early May. "A special material, stone mastic asphalt, was used to provide a comfortable departure and landing strip on the runway," he added. The airport will serve about 2 million passengers annually, and will boost air travel to and from the two provinces that has a total population of 1.2 million. By 2023, Turkey plans to have at least 60 operational airports, including the Hakkari-Yüksekova Airport in Turkey's southeast, as well as at least three airports in the southern province of Antalya.